With The Hermit’s new album, everything is about the number 4: the four elements – fire, water, earth, air – each represented through four tracks on an album that closes with “Abyss”, a mystical final track and psychedelic ambient journey into nowhere. The 16 tracks leading up to this finale expose The Hermit’s trademark sound consisting of dark post-industrial EBM references, early rave memories and contemplative synth improvisations, a hybrid which reminds not least of the legendary Analogue Bubblebath-series. But something is different this time: without any doubt, „Liber 4“ comes across as the most mature piece of work in The Hermit’s oeuvre so far. 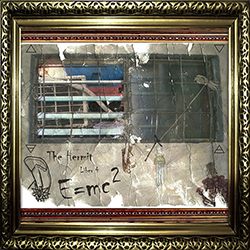 While his earlier works often had a sketchy appeal to them, apparently struggling to focus on one of the many ideas The Hermit brought to the table, his new tracks demonstrate a much more confident drive towards a singular goal for each of the highly diverse tracks, which finally are spelled out in all consequence until the very end. A track like “Hermaphrodit” would have suited the likes of Robert Görl and Gabi Delgado, “There Is” sounds like the early AFX sharing a cigarette with Front 242 in a chillout room somewhere during the 90s, while the sci-fi ambient funk of “Equation” reminds of the likes of Kenny Larkin. The Hermit’s works always used to be very diverse and mind-blowingly full of ideas. What’s new here: each and every idea gets the space it deserves and is spelled out to perfection.